WASHINGTON — Over the past two weeks, President Trump has repeatedly boasted of being a boon for the military. He has trumpeted the Pentagon’s $700 billion budget, taken credit for staving off a “major war” with North Korea and generally declared victory on all things related to the United States’ armed forces. “Look, I accomplished the military,” Mr. Trump said, in a perplexing verbal offering at the Oval Office in recent days. But has he? 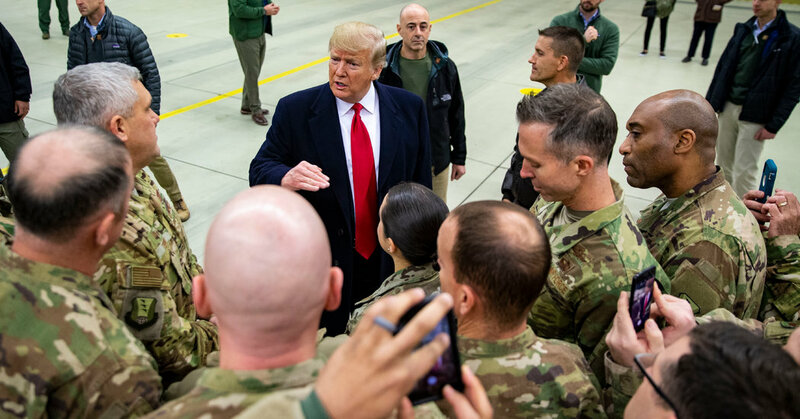 A look at two years of the military under Mr. Trump produces a report card with plenty of incompletes and far more failing grades from national security experts than the A+ the commander in chief has awarded himself. Mr. Trump’s expressed love for the men he called “my generals” has given way to chillier climes. At the Pentagon, senior officials joke about having a half-life with Mr. Trump, one whose longevity is determined by whether they can steer clear of the president. Mr. Trump so often overlooked the advice of the Pentagon that his defense secretary resigned in December, citing irreconcilable differences. Mr. Trump has also undermined the authority of his most senior military leader, Gen. Joseph F. Dunford Jr., announcing his successor as the chairman of the Joint Chiefs of Staff almost a full year before his term is up. That has sown confusion about command guidance throughout the ranks of the sprawling military bureaucracy. And even on the budget question — Mr. Trump’s prime example of his military accomplishments — defense experts said the verdict was not quite as cut and dried as the president made it sound. Here is a look at two years of Mr. Trump’s chief military accomplishments. On Mr. Trump’s signature boast, military spending, the Pentagon is at levels last seen under … President Barack Obama. The $700 billion that Mr. Trump trumpets is actually less than what Mr. Obama spent on war and military in the 2010 fiscal year, when adjusted for inflation. According to the Office of Management and Budget’s calculations, actual military spending under Mr. Obama in 2010 was $851 billion. Even after subtracting military-related spending from other agencies — including the Departments of Homeland Security, Veterans Affairs and State — Mr. Obama budgeted $690 billion in 2010 for the Pentagon and war spending. That included funds for winding down the war in Iraq and ramping up the war in Afghanistan. When adjusted for inflation, the total came to around $795 billion in current funding. Mandatory spending cuts by Congress that went into place in 2011 meant that military spending went down in the later years of Mr. Obama’s term. So Mr. Trump can accurately say that he has increased military spending since then. But under Mr. Trump, the military is also smaller than it was when it peaked during the Obama administration. There are currently 1.2 million active-duty service members, compared with 1.4 million in 2011. Outlining his plans for the military during a national security speech in Philadelphia in 2016 when he was campaigning for president, Mr. Trump called for an expansion of the military and 75 new ships for the Navy. Today, the Navy says it will add 10 more ships than what Mr. Obama had planned to build during the same period — from now to 2024. Mr. Trump credits himself with averting a war with North Korea. “If I had not been elected president of the United States, we would right now, in my opinion, be in a major war with North Korea,” he said during the State of the Union address last week. But it was he who elevated the possibility of war from the start. At several points in 2017 and early 2018, Mr. Trump and Mr. Kim traded insults like “rocket man” and “dotard.” Pentagon officials said they became so concerned about the escalating tensions that senior members of Mr. Trump’s national security team held teleconference calls to monitor the trajectory of North Korean missiles, fearing that a conflict would be incited if the weapons flew close enough to, say, Guam, home to a strategic American air base. During a summit meeting in June, Mr. Trump and Mr. Kim signed a joint statement agreeing to take steps toward disarming North Korea’s nuclear arsenal. But satellite images show that the North may still be pursuing a nuclear program. The two leaders are due to meet again — in Hanoi, Vietnam, this month. Since their meeting in Singapore, Mr. Trump has softened his threats of war against North Korea. But he is toning it down from what he turned up himself. During the State of the Union address, Mr. Trump said that after years of seeing the United States “treated very unfairly by NATO,” he was forcing other nations in the military alliance to pay their fair share. This is true — if the definition of fair share means increased domestic military spending by each member state of the North Atlantic Treaty Organization. Still, national security experts said that Mr. Trump’s congratulations should extend not only to Mr. Obama but also to Presidents George W. Bush and Bill Clinton. Just about every American president has prodded other states in the Atlantic alliance to spend more on their own national defense. In 2014, during the Obama administration, each alliance member pledged to spend 2 percent of its gross domestic product on its own defense each year by 2024. Mr. Trump’s demands have put NATO in what national security experts said is possibly the most precarious position since the military alliance was formed 70 years ago. But even as allies fret that the United States might withdraw from the North Atlantic Treaty Organization, military spending among member states has continued growth levels that began under Mr. Obama.